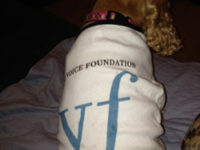 GIVING VOICE TO YOUR PUP! 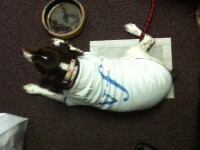 The newest in doggy wear. 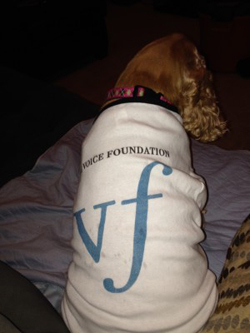 The Voice Foundation logo is on a white cotton tee-shirt with black piping for your best friend. XXXL are available on order for large breeds. Sandpiper is a blonde Cocker Spaniel sporting the size L.
Mackenzie is a Black & White Springer Spaniel modeling the size XL. The cotton tee is just right for a cool day or night, Buy the matching tee for humans to rock your daily walk together.